6/25/99 - My First award. The "Out of This World" Award. Given to Lady Sharifire's Sanctuary from Audrey's World, due to the hard work and talent that went into creating the sanctuary. I am very proud of this award. Please click on the award below to visit Audrey's Site. Thanks Audrey!! 6/26/99 - Silver and Dragon's Wolf "Award of Excellence". Given to Lady Sharifire's Sanctuary for excellent content and features. Please click on the award below to visit Silver and Dragon Wolf's Den. Thanks Silver and Dragon Wolf!! 6/27/99 - Uyen Nhi's "Award of Excellence". Presented to Lady Sharifire's Sanctuary for a wonderful job on the site. Please click on the award to visit Jennifer's page. Thanks Jennifer!!! 6/27/99 - Universal Web Rating's "Comet Award of Achievement". Given to Lady Sharifire's Sanctuary for a job well done on layout, design and information. Please click on the award to visit the site. Thanks Audrey!! 6/28/99 - The "Leahy Family Homepage Award". Given to Lady Sharifire's Sanctuary for a great job so far!! 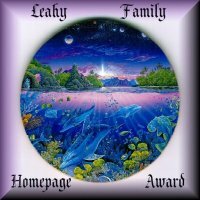 Please click on the award to visit the Leahy Family homepage. Thanks Guys!! 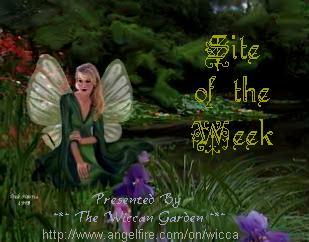 6/29/99 - The Wiccan Garden's "Feature Site of the Week Award". Given to the Sanctuary for the hard work and a great page so far. Please click on the award to visit the Wiccan Garden!! Thanks Lynxspirit!! 7/5/99 - Lady Draek's "Award of Excellence". Given to Lady Sharifire's Sanctuary for the excellent work on the site. Please click on the award to visit Lady Draek's Site!! Thanks Lady!! 7/5/99 - Stefanie's "Kul Award". Presented to the Sanctuary for the "kul" site home on the web that was produced. The award link is not active yet, I will let you know when it is. But in the meantime....Thanks Stefanie!! 7/7/99 - Today's Woman's "Perfect As a Rose Site Award". Given to the Sanctuary for a great site. Please click on the award below to visit this great site!! Thanks so much!! 7/11/99 - Alenka's webpage rating. 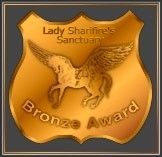 Presented Lady Sharifire's Sanctuary with the Pegasus' Bronze award. The Sanctuary was given the following ranking.... (click on the award to visit Alemka's site)!! Thanks!! 7/22/99 - Elena's "Excellent Pagan Site Award". Was presented to the Sanctuary for it's excellence in the Pagan topic. Click on the award below to visit Elena's site!! Thanks Elena!! 8/22/99 - Ises's "Award of Excellence". Presented to Lady Sharifire's Sanctuary for it excellence in the Pagan Theme. Click on the award below to visit Ises's Site!! Thanks Ises!! 8/22/99 - Ises's "Inspiring Women of The Web" award. Presented to the Sanctuary for being a great site ran by a woman. Click on the award below to visit Ises's Site!! Thanks Ises!! 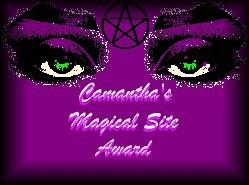 8/28/99 - Camantha's "Magickal Site Award". Given to the Sanctuary for being a great magickal site. Thanks Camantha!! 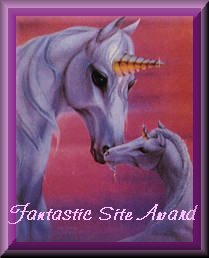 9/1/99 - Michelle's "Fantastic Site Award". Presented to the Sanctuary for being a fantastic Site on the web. Please click on the award to view Michelle's Site!! Thanks Michelle!! 9/21/99 - Gaia Gates "Seal of Excellence" award!! Given to websites of members that belong to Gaia Gates!! Thanks Guys!! 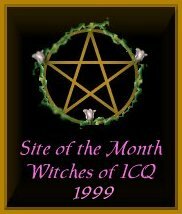 11/7/99 - Witches of ICQ "Site of the Month" award!! Given to Lady Sharifire's Sanctuary for a great website for the month of November!! Thanks Guys!! 3/3/00 - A VERY SPECIAL AWARD : Tessa's "Web Page Design" award!! Given to Lady Sharifire's Sanctuary for wonderful page design,hard work and content of your site!! Thanks Sis!! 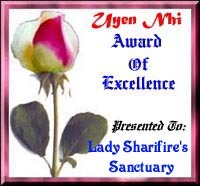 Also, Lady Sharifire;s Sanctuary was the first site to ever receive this award!! It means a lot to me!